★ = Dublin Hammers Meeting (Shown Live on television). ✈ = Dublin Hammers Trip. Pablo Zabaleta signs on a free from Manchester City. Havard Nordtveit leaves after one season to join German outift Hoffenheim. Enner Valencia goes to Mexican club Tigres. Johnathon Calleri goes back to Deportivo Maldonado - End of loan. Gokhan Tore goes back to Besiktas - End of loan. England Goalkeeper Joe Hart joins on a year long loan from Manchester City. Goalkeeper Darren Randolph moves to Middlesborough for £5million. 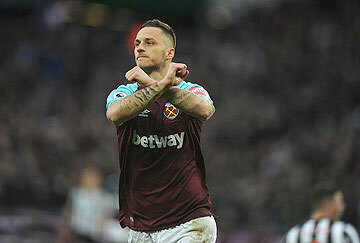 Marko Arnautovic joins after the forward completes a £24million move from Stoke. Mexican striker Javier Hernandez joins from Bayer Leverkusen for a fee of £16million. Ashley Fletcher completes a £6.5million move to Championship side Middlesbrough. West Ham sign 18 year old midfielder Sead Haksabanovic from Swedish club Halmstads. Sofiane Feghouli completes £4million move to Galatasary. Germany - 17th Sturn Graz. 0-0. Germany - 20th Fulham. 2-1. Lanzini, Fletcher. Germany - 28th Werder Bremen. 0-1. Germany - 29th Werder Bremen. 2-2. Arnautovic, Martinez. Hamburg - 1st Altona 93. 3-3. 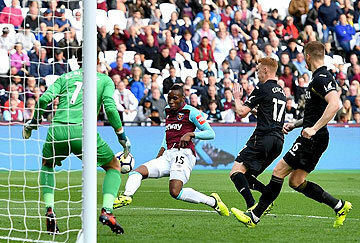 Martinez, Ayew, OG. Reykjavik - 4th Manchester City. 0-3. No home games in August due to Athletics Competition at the London Stadium. Out injured before a ball is kicked include... Kayoute, Lanzini, Carroll, Cresswell and Antonio! ★ 13th Manchester Utd (a). 0-4. ★ 19th Southampton (a). 2-3. Hernandez x2. 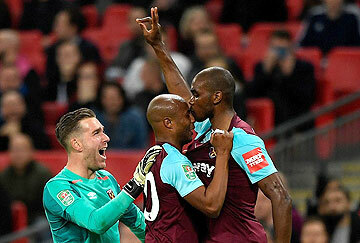 Antonio returns, but Winston Reid is injured in the warm up! Arnie sent off, 2-0 down, with 10 men we come back only to concede a second (soft) penalty 3 minutes into injury time. ★ 23rd Cheltenham Town (a). Carabao Cup 2nd Round. 2-0. Sakho, Ayew. Robert Snodgrass joins Aston Villa on season long loan. Lanzini and Kouyate back in squad for Newcastle game. ★ 26th Newcastle Utd (a). 0-3. A shockingly awful performance puts us well and truely bottom of the table. ★ 11th Huddersfield Town (h). 2-0. 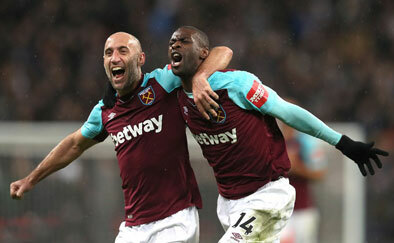 Obiang, Ayew. 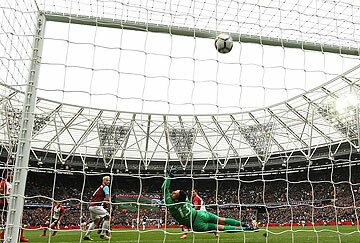 Carroll, Hernadez and Antonio start up top, 3pts and a clean sheet... and we are up and running! ★ 16th West Bromich Albion (a). 0-0. 19th Bolton Wanderers (h). Carabao Cup 3rd Round. 3-0. 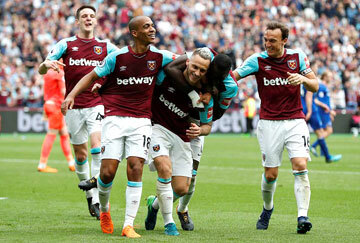 Ogbonna, Sakho, Masuaku. ★ 23rd Tottenham (h). 2-3. 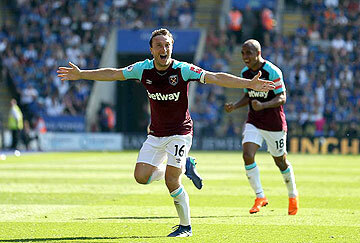 Hernandez, Kouyate. ★ 30th Swansea City (h). 1-0. Sakho. LP:15th. ★ 14th Burnley (a). 1-1. Antonio. Carroll sent off, Burnley equalise in the last minute! ★ 21st Brighton Hove Albion (h). 0-3. ★ 25th Tottenham (a). Carabao Cup 4th Round. 3-2. 2-0 down at half time, then 3 goals in 15 minutes see us through to face Arsenal in the Quarter finals. ★ 28th Crystal Palace (a). 2-2. 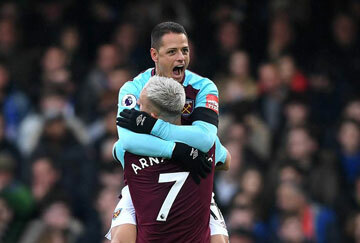 Ayew, Hernandez. 2-0 up at half time, concede the equaliser 5 minutes into injury time! ✈ 04th Liverpool (h). 1-4. 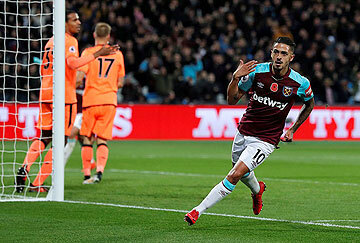 Lanzini. After another poor showing Slaven Bilic is sacked... David Moyes takes over! ★ 19th Watford (a). 0-2. ★ 24th Leicester City (h). 1-1. Kouyate. ★ 29th Everton (a). 0-4. Another shockingly awful performance as Rooney scores a hat-trick. ★ 03rd Manchester City (a). 1-2. 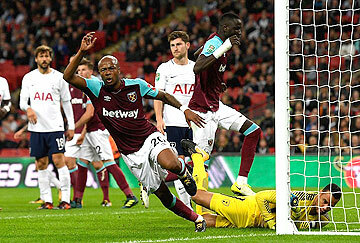 Ogbonna. ★ 09th Chelsea (h). 1-0. 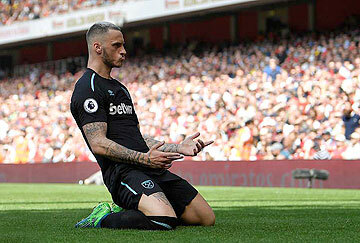 Arnautovic. Another solid performance for the second week running and Arnie gets off the mark at last! ★ 12th Arsenal (h). 0-0. ★ 16th Stoke City (a). 3-0. Noble(p), Arnautovic, Sakho. ★ 19th Arsenal (a). Carabao Cup 5th Round. 0-1. Totally uninspiring performance sees us out of the cup with barely a whimper. Disappointing. ★ 23rd Newcastle Utd (h). 2-3. Arnautovic, Ayew. 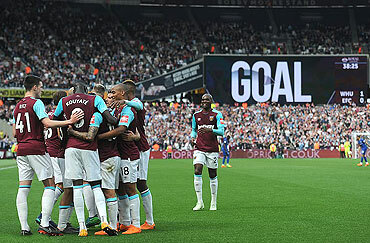 Ayew misses a penalty at 2-1 down, they run down the other end a score? ★ 26th AFC Bournemouth (a). 3-3. Collins, Arnautovic x2. 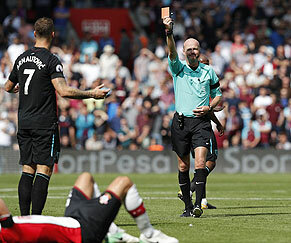 Robbed by yet another bad reffereeing decision as Bournemouths last gasp equaliser was off-side and hand-ball. ★ 02nd West Bromich Albion (h). 2-1. 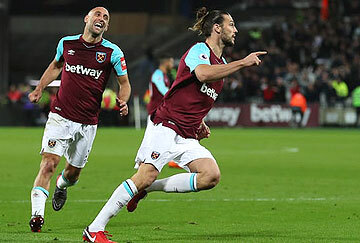 Carroll x2. One nil down at half time, dramatic injury time winner! ★ 04th Tottenham (a). 1-1. Obiang. ★ 07th Shrewsbury Town (a). FA Cup 3Rd. 0-0. Another totally uninspiring cup performance. Disappointing. ★ 13th Huddersfield Town (a). 4-1. Noble, Arnautovic, Lanzini x2. 16th Shrewsbury Town (h). FA Cup 3Rd Replay. 1-0 AET. Burke. ★ 20th AFC Bournemouth (h). 1-1. Hernandez. Transfer News... Sakho finally gets his wish and leaves West Ham for Rennes in France. 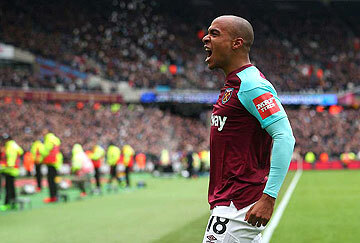 We get Portugese midfielder Joao Mario from Inter Milan, loan deal to the end of the season. ★ 27th Wigan Athletic (a). FA Cup 4Rd. 0-2. 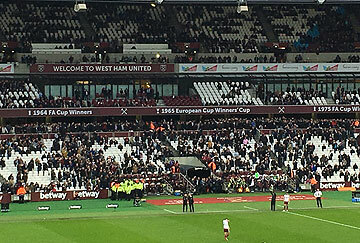 What is it with the cup this season? Awful performance, no shots on target. Masuaku sent off for spitting. 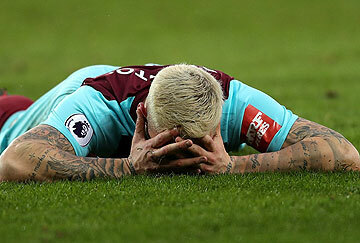 Our latest injury crisis in full swing, no Carroll, Antonio, Arnie, Reid, Lanzini, Obiang, Fonte, Fernandes, and to top it off Masuaku banned for 6 weeks! ★ 30th Crystal Palace (h). 1-1. Noble(p). Transfer Deadline Day... We sell Andre Ayew back to Swansea City... Forward Jordan Hugill joins from Preston North End. ★ 03rd Brighton Hove Albion (a). 1-3. Hernandez. Free agent and defender Patrice Evra, joins on a short term contract. ★ 10th Watford (h). 2-0. 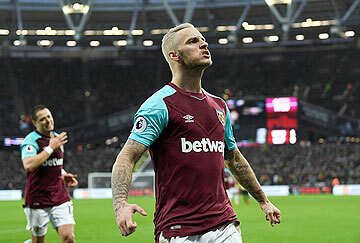 Hernandez, Arnautovic. Arnie and Antonio return. 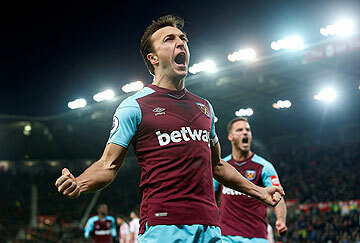 Arnie plays a starring role in a much needed victory. Jose Fonte signs for Chinese Super League side Dalian Yifang for an undisclosed fee. An anti-board march is organised. ★ 24th Liverpool (a). 1-4. LP:13th. ★ 03rd Swansea City (a). 1-4. Antonio. LP:14th. The anti-board march planned for the Burnley game is cancelled in a dramatic u-turn by the organisers. Defenders Reid and Byram out for the rest of the season. ★ 10th Burnley (h). 0.3. LP:16th. 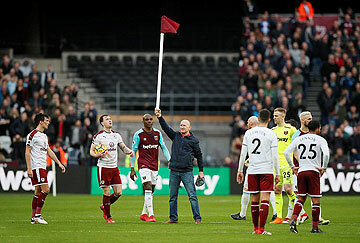 As the anti-board feelings grow amoung the fans, the Burnley game was disrupted by pitch invasions. We drop deeper into the relegation battle... 18th, 19th and 20th are the relegation finishing positions!. 3 weeks before next game because of FA Cup, other teams play, we drop to 17th, 2 points above Southampton! ★ 31st Southampton (h). 3-0. Mario, Arnautovic x2. ★ 08th Chelsea (a). 1-1. Hernandez. LP:14th. ★ 16th Stoke City (h). 1-1. Carroll. ★ 22nd Arsenal (a). 1-4. 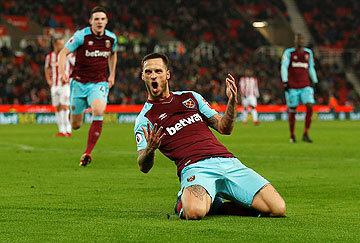 Arnautovic. LP:15th. ★ 29th Manchester City (h). 1-4. 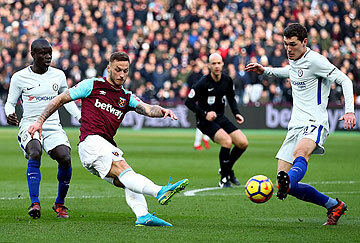 Cresswell. 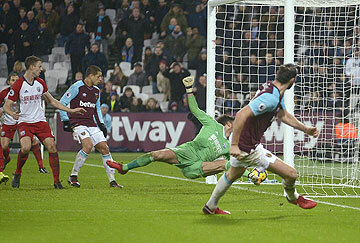 David Moyes has the team training WITHOUT the ball in the run up to this game, it showed as they looked like they had excepted defeat before the game had even kicked-off. For a 10 minute spell at the end of the first half they had a go, scored and should have had a penalty. 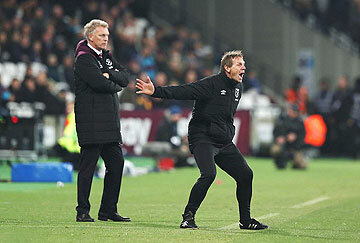 The half time team talk from the gutless Moyes inspired a second half performance that can only be described as insipid! ★ 05th Leicester City (a). 2-0. Mario, Noble. With that win and other results going our way... we are now safe from relegation for another year! ★ 10th Manchester Utd (h). 0-0. ✈ 13th Everton (h). 3-1. Lanzini x2, Arnautovic. David Moyes contract comes to an end and he and his backroom staff leave the club!